The ISTC held their annual Technical Communication UK Conference at the Wyboston Lakes Executive Centre, Cambridgeshire, from September 13 - 15 this year. 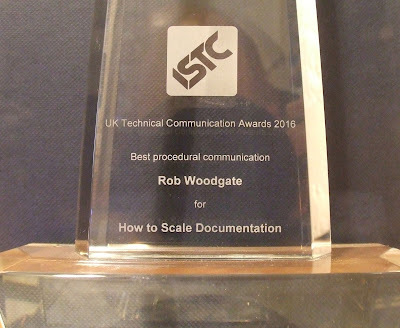 I attended the gala dinner on the evening of the 14th, and whilst I was there the UK Technical Communication Awards winners for 2016 were announced. "Really well organised with appropriate and consistent details. The structure aids readability. Great typography choices, used to enhance the content, and to visually chunk information. Great use of space and colour in titles. The entry’s distinct conversational style works extremely well with the chosen subject and audience. This entry is so effective because it makes everything seem so manageable. The user is guided through the series of articles and can be confident of finding explanations and at the right level." To say that I was surprised when the ISTC told me I'd won would be a huge understatement. Up until that point my entire trophy collection consisted of a bronze medal in a judo competition when I was 16 and a plastic cup as a member of a league and cup double winning cribbage team when I was 18. I didn't need a trophy cabinet so much as a trophy shoebox. Now I've got a very handsome (and heavy) glass trophy that's got pride of place on the bookshelf in my office. To say I'm happy doesn't begin to describe it. Galyna Key, who couldn't attend the conference this year, but does such a wonderful job organising, promoting and running the UKTC awards. And to everyone else I met at the Conference this year, thank you for making me feel so welcome. It was a pleasure to meet so many dedicated, passionate and skilled technical communicators. I hope to see you all next year!